* John Ciotta & His 4 Piece Band. This guy puts on an absolutely great show! Jeff Eats just picked-up 4 tickets at kingspointdelray.com. Checkout the video down below! 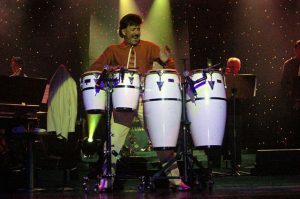 John has been exciting audiences world-wide for years, as an entertainer, singer and percussionist. From Atlantic City to Las Vegas, Hong Kong and Singapore to Europe and Scandinavia, John has managed to find his way into the hearts of every nationality and culture, no matter how diverse. Whether he’s performing in English, Italian, French, Spanish or German, John’s emotion-charged deliveries and broad appeal move every member of his audiences right to the heart. John’s audiences have included such luminaries as Bob Hope, Donald Trump, Billy Joel and drummer Liberty DeVito, The Righteous Brothers and Mario Lamanna, 1st Tenor to the Vatican, among many others. He has been joined onstage during his shows by Paul Shaffer (“The Late Show with David Letterman”), The Checkmates, former World Heavyweight Champion “Smokin’ Joe” Frazier, Italian Pop Star Andrea Mingardi and members of the Wayne Newton and Marilyn McCoo bands (of “The Fifth Dimension”). John has been the opening act for comedian Pat Cooper, as well as The Coasters and hit recording artists Rare Earth. John was invited to perform the “Star Spangled Banner” at the Evander Holyfield-Alex Stewart World Heavyweight Championship bout, a 2-million subscriber Pay-Per-View event. Supporting a cause he holds dear, he continues to perform the National Anthem at numerous Veterans events and regularly performs at his local State Veterans Home. John has recently completed a month-long residency in the venerated “Superstar Theatre” at Resorts Casino Hotel in Atlantic City, home to such icons as Frank Sinatra, Don Rickles, Debbie Reynolds and more. He has written and directed variety segments for Costa Cruise Lines, and has produced or co-produced his four most recent CD’s. He has collaborated with award-winning playwright Phyllis Barash, and was a contributing songwriter to a musical produced by Lou Paciocco, producer of the long-running hit revue, “La Cage”. John’s unique combination of high energy and warmth, coupled with unparalleled charisma and genuine love for his audiences have made him a favorite in every corner of the world. That’s why this World-Class Show is creating a Worldwide buzz!